Sulfosuccinate Market size was valued over USD 284 million in 2015 and is forecast to experience 6% CAGR by 2024. Increasing personal care products demand is analyzed to be the key factor propelling the global sulfosuccinate market size over the projected timeframe. The global skincare business generated revenue close to USD 100 million in 2013 and is projected to exceed 150 million by 2024. In addition, the hair care industry was valued roughly around USD 70 million in 2013 and is estimate to touch USD 100 million over the forecast timeframe. The product offers excellent emulsifying, wetting, and dispersing properties, which makes it ideal for its applications in personal care products including cleaners, baby shampoos, and bubble baths. These are present in shampoos and cleansing products that are used on sensitive and oily skin. Changing lifestyle and increasing consumer disposable income, particularly in the BRIC nations will complement the overall industry growth by 2024. The global household detergents market size in 2013 was more than 30 kilo tons and will surpass 60 kilo tons over the forecast timeframe. The product is an anionic surfactant and is extensively used in detergents. It is also used as solubilizers and dispersants. The primary function of the product as detergents is soil removal from fabrics and suspend the soil in the wash water. In addition, it is also used as cleansers for dry cleaning, glass and floor cleaners, and carpet shampoos. They are also used in leather and fur industries. 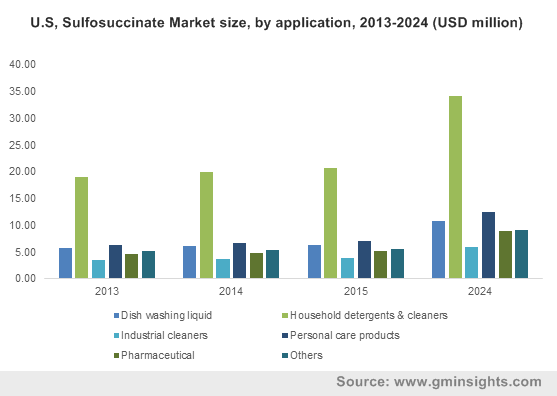 Growing health & wellbeing industry will boost the specialty detergents & cleaning agent’s business growth, which in turn would proliferate the sulfosuccinate market share in the near future. Bio-based alcohol ether sulfate (AES) can replace petroleum-based AES. These bio-based surfactants contribute similar desirable properties to personal care products and detergents as petroleum-based surfactants. Thus, these surfactants are extensively used as the product substitutes in personal care and detergents industries. This may hamper the overall sulfosuccinate market size over the forecast timeframe. Additionally, sulfosuccinates face challenging regulatory, environmental and consumer pressure pertaining to the production, packaging, transporting, use and its disposal owing to obstruct industry growth. For instance, surfactants product registration and their formulated products are strictly regulated and directed by the EPA. and REACH. However, the product can be used to drill and produce oil, natural gas and coal bed methane. An aqueous surfactant formulation is injected into a mature oil reservoir. Recovering oil & gas industry is likely to create new growth avenues to the industry participants. Global sulfosuccinate market share for industrial cleaners was approximately USD 30 million in 2015. The industrial cleaning industry utilizes cleaners formulated using sulfosuccinates in various sectors including office buildings, restaurants, food processing plants, metal treatment & cleaning and transportation vehicles. The business growth for this segment is analyzed to be driven by increasing safety & environmental regulations along with growing public awareness towards health and hygiene. Pharmaceuticals application will witness gains exceeding 5% CAGR over the forecast timeframe. The product is used as an excipient in the production of tablets as a lubricant and in syrups as an emulsifier. Rising health related issues across the globe, results in increasing medicines demand. This will ultimately boost the global sulfosuccinate market size by 2024. North America, led particularly the by U.S. sulfosuccinate market size was valued at over USD 55 million in 2015. The regional growth is mainly attributed to the increasing pharmaceutical sector in the U.S. Furthermore, shale gas exploration in the U.S. will further contribute to the regional growth, as the product can be used in in drilling and mining applications. Europe, led by France and the U.K. was the dominated the overall industry in 2015. The region will retain its dominance over the forecast timeframe, as it is the highest producer and consumer of personal care products. Asia Pacific, primarily led by India and China shall experience highest gains more than 6.5% CAGR by 2024. Increasing consumer disposable income, resulting in upgraded lifestyles has driven healthcare and personal care industry substantially in the region. This will subsequently drive the sulfosuccinate market share over the forecast timeframe. Global sulfosuccinate market share was competitive in 2015. The Dow Chemical Company, MFG Chemicals, Huntsman Corporation, and Stepan Company were some of the leading players in the industry. Competition intensity was high primarily due to presence of established players who have integrated their presence across multiple stages of the industry ecosystem. High degree of integration helps leading players achieve the presence. Mergers & acquisitions, price hike and capacity expansion are some of the strategies which plays a key role in the industry. Maleic acid anhydride is the primary feedstock used in the production of sulfosuccinates. Synthesis of sulfosuccinates is usually done in a two-step procedure. In the first step, maleic anhydride reacts with a fatty alcohol, while in the second step, sulfonation of maleic ester occurs. Sulfosuccinates are sodium salts of alkyl ester of sulfosuccinic acid. Sulfosuccinic acid surfactants are extensively used in the cosmetic industry to improve the mildness of personal care products. The product possesses excellent foaming, wetting, emulsifying, and solubilizing properties. In addition, they also offer high biodegradability, surface activity along with low critical micelle concentration. They are used in various types of cleansing formulations, industrial cleaners, household cleaners & detergents, textile, pharmaceutical, polymers, paints & coatings, leather, printing, and agriculture. Increasing specialty detergents & cleaning agent’s acceptance along with growing personal care products demand will boost demand. However, industrial shift towards bio-based surfactants might hinder growth. Historical data coverage: 2012 to 2014; Growth Projections: 2015 to 2024.